Your time entries are logged on your smartphone even when you’re offline. As soon as your device connects to the internet, the entries are automatically synced to the server. 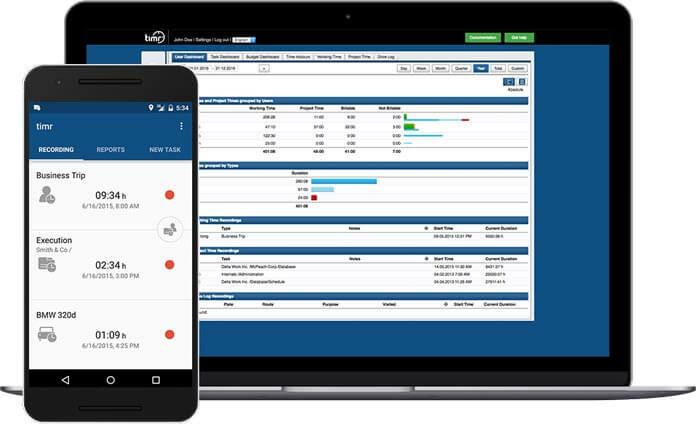 The choice of mobile device for time tracking is completely yours. Timr native apps are available for all major platforms. Use GPS positioning to get insights into your employees’ whereabouts. This helps you allocate incoming work quickly and efficiently and dispatch the employee closest to the job site. Your smartphone covers all functionalities and tracks working time, project hours and even mileage in one app. timr makes time tracking on your Android smartphone easy as pie. Thanks to the automatic sync between the mobile app and the web app, all time entries are saved in the web app. Your data is always safe, even when your smartphone gets stolen or breaks. The web app lets you do all the admin work comfortably from the office while the mobile app is your time tracker on the go. Simply track working time and project hours while you’re out. All your time entries are automatically synced to the web app. timr completely streamlines your mileage log. Log your trips on your smartphone with a few simple taps. Your mileage will be logged and then synced to the server.